Climb several moderately challenging peaks in Altai Tavan Bogd (Five Saints) National Park and experience the endless steppes, crystal clear rivers, and distinctive culture that make Mongolia a destination unlike anywhere else. Accessible altitudes of the Tavan Bogd massif are the perfect introduction to Himalayan-style climbing. Venture to western Mongolia, one of the least explored corners of the world, and soak in the unparalleled views. Benefit from first class service including camp cooks, porters, camels, and jeep service to keep packs light and the climbing enjoyable. Enjoy our 3 to 1 climber to guide ratio and benefit from the experience, expertise, and tutelage of RMI's renowned guides. Our trip begins in the capital city of UlaanBaatar, where we will witness the unforgettable juxtaposition of modern mining wealth and traditional nomadic lifestyles. Ger camps (yurts) still hold their own within a stone's throw of glass clad skyscrapers. From the Choijin Lama temple to the National Museum of Mongolia, we spend time exploring the city and learning about Mongolian history and culture. We then fly west to the town of Olgii on the western border of Mongolia. Once in Olgii we make the six-hour drive west to the entrance of Altai Tavan Bogd National Park. On our drive we will pass traditional gers (yurts) while enjoying the seemingly limitless views of the western Mongolia countryside. Reminiscent of the Himalaya, the Altai Mountains offer incredible adventure and beauty at a lower altitude. Our expedition into the Altai Mountains begins with a trek to Potaniin Base Camp. Potaniin Base Camp is the starting point for our first objective, Malchin Peak (13,287’). With Malchin Peak under our belts we move to High Camp and make our summit attempts of Mount Khuiten (14,350’), the highest peak in Mongolia, and Nairamdal Peak (13,714’). Trekking out of Altai Tavan Bogd National Park is just as memorable as the trek in as we follow the White River through the Tsagaan Gol Valley. A night in Olgii after our climb allows us to experience the Kazakh culture of western Mongolia. 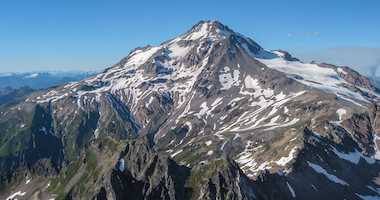 Rainier Mountaineering, Inc. was established in 1969 and is one of America's oldest and most-trusted guide services. We are the largest guide service on Mt. 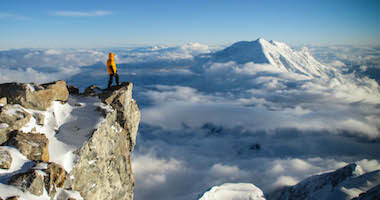 Rainier and Denali and leaders in guiding climbs and treks around the globe. Our years of leading mountain adventures give us the experience and knowledge to lead the best possible trips. We work hard to live up to our reputation as an industry leader. Our trip preparation before departure takes care of the details for you, from hotels to airport transfers, so that you can focus on preparing for the climb instead of the distraction that comes with coordinating logistics. Our Mongolia: Mt. 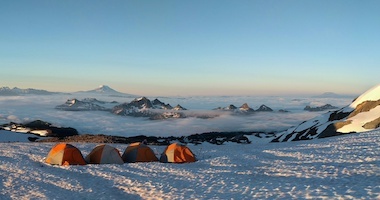 Khuiten climbs are led by RMI’s foremost U.S. guides, who bring years of climbing experience on not only Kilimanjaro but on mountains all over the world, from the Andes to the Alaska Range to the Himalayas. As you reach higher elevations and test the limits of your experience, the value of an accomplished, highly trained RMI Guide held to our standards and who can effectively communicate with you cannot be understated. We use RMI's own climbing equipment brought from the U.S., ensuring that our expedition standards of safety, quality, and reliability are met. Our exceptional focus on detail, our unparalleled level of climber attention, and our genuine excitement for these adventures are what make our programs truly memorable. Safety has always been RMI's top priority and we strive to create the safest mountain experience possible. RMI's experienced team of guides focus on leading a fun and successful climb without compromising safety. We apply the same strict standards of safety we bring to Alaska and the Himalayas to our climbs in Mongolia. Careful planning, precise ascent profiles, daily weather forecasts, and diligent attention are taken as we venture to high altitudes. 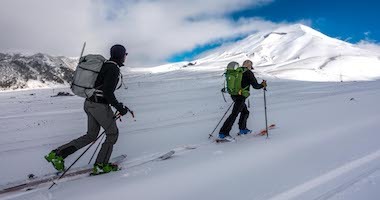 Our guides are trained, experienced, and certified by rigorous American standards in wilderness and high altitude medicine, avalanche training, and leave no trace techniques. We have spent considerable time in the mountains and know how to do so safely and comfortably; we don’t rush to the top but instead focus on using techniques that allow us to adjust and even excel in the thin air. Comprehensive medical kits, rescue equipment, and radio and satellite communication equipment are carried with the team throughout the climb. Depart US for UlaanBaatar, Mongolia (ULN). During your flight you will cross the International Date Line and travel time is approximately 18 - 28 hours. *If your flight/connections take more than 36 hours, you will need to book your trip to depart the US one day earlier. Most flights arrive in UlaanBaatar (ULN) in the late evening. Upon your arrival, a taxi ride takes you to our hotel. Overnight in UlaanBaatar. This extra day is scheduled into the itinerary in case we encounter poor weather or need additional time for acclimatization. Continued flights and arrival to US. 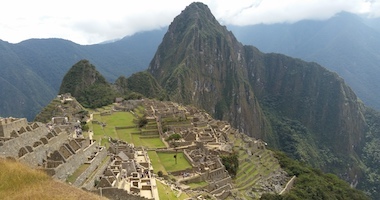 CTT Destinations Travel Coordinator Pirjo DeHart has served climbers and adventurers for over 25 years. Specializing in small corporate and adventure travel, she works to assure your trip is stress free by taking care of the practical travel details and evaluating travel insurance. 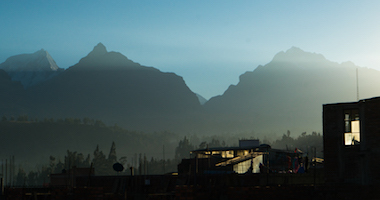 Each trip is handled with the utmost attention to detail so that you may focus on your adventure. You can contact Pirjo by phone at (425) 831-0367 or email: rmiexpeditions@cttdestinations.com. Travel to Mongolia's Chinggis Khan International Airport (ULN) typically takes 18 - 28 hours from the U.S. depending on your departure city, available connections, and flight times. Flights generally arrive in the evening of Day 2 of the itinerary. Flights departing UlaanBaatar (ULN) may be booked for any time on Day 15 of the program. A valid passport is required when traveling to Mongolia. Your passport must be valid for 6 months beyond the expected return date. Proceed to Baggage Claim and then to Customs. There will be a random selection of bags for inspection. Be sure to keep all your bags together. A transfer will be arranged for you from the airport to our hotel. The provided transportation in Mongolia as stated in the itinerary is via private vehicle. The Altai Mountains are in a remote region of Mongolia without easy access to definitive medical care. We are our own rescue team. The medical facilities in UlaanBaatar and other urban areas in Mongolia are limited except for routine, non-emergency needs. We will work with our tour operator to access an appropriate level of care should the need arise. Mongolia is the second-largest landlocked country in the world (behind Kazakhstan) and shares borders with China and Russia. Mongolia has the lowest population density of all independent countries, with just over 3 million residents. Approximately 45% of the country's population lives in the capital city of UlaanBaatar. The dominant religion is Buddhism with about 75% of Mongolians; the remaining 25% comprises Shamanic, nones, Christians, and Muslims. Recorded Mongolian history dates back to the third century BCE with the Hunnu ("People of the Sun" or the Huns). The Great Mongol Empire formed under Chinggis Khan (Genghis Khan) in 1206. The Mongolian Empire spread to eastern Europe and to all of China and Central Asia. After the collapse of the Mongolian Empire, Mongolia came under Chinese rule. Mongolia reemerged as an independent nation in 1924. China did not recognize their independence until 1945 as a result of needing Soviet Union assistance to fight the Japanese invasion. This led to a split of the historic Mongolian nation - Outer Mongolia became independent while Inner Mongolia is a province of China. Mongolia enjoys a close relationship with modern day Russia as a result of their influence in recognizing Mongolia's independence. The largest cultural festival in Mongolia is the Naadam festival; this national holiday occurs each July. During Naadam one can witness the three main sporting events in Mongolia - wrestling, horse racing, and archery. While UlaanBaatar holds the main Naadam festival, small Naadam festivals take place throughout the country during July. In Western Mongolia, Olgii is home to the Golden Eagle Festival each October. This is the largest gathering of eagle hunters in the world. Olgii also hosts Nauryz Festival, or Kazakh New Year on the 22nd of March. Known as the "Lan of Blue Skies," Mongolia boasts approximately 250 days of sun each year. Peak climbing season corresponds with peak tourist season, June - August. At this time of year, you can expect warm, mostly dry weather with some thunderstorms. The shoulder seasons of May and September see unpredictable weather. Winters in Mongolia are known for being exceptionally cold. Although it is not expected that we dress formally, we should dress modestly. Casual and comfortable clothing and shoes are suggested. Avoid holes in clothing, especially socks, as they are considered to bring bad luck. Refusing a gift, including food, is considered rude - if offered food take a small bite of something. Always receive items with the right hand, palm facing up. When drinking, hold the cup by the bottom instead of the top rim. Use your right hand to take food or drinks. Pointing with your index finger is a sign of disrespect, try an open palm instead. Avoid leaning against doorframes or other support columns. Should you accidently bump feet with someone or step on someone's foot, promptly shake their hand. Failing to shake their hand is considered an insult in this situation. Mongolians have a calm demeanor and rarely use anger as a means to accomplish something. Calm and composed is the best approach. Haggling for prices is frowned upon; the stated price is the price you are expected to pay. Electricity in Mongolia is different than in the United States. Mongolia uses type C and E sockets and plugs. Type C is the standard "Euro" plug and works with plugs E and F. Type E works with plugs C and F if it has an additional pinholes. In Mongolia, the standard voltage is 220V and the frequency is 50 Hz. U.S. appliances will require plug adaptors, convertors or transformers. Remember to bring any necessary adaptors if you plan to recharge electronics. The current currency of Mongolia is the Togrog (T), also known as tugrik. In Mongolia you are almost always required to pay for goods or services with the Togrog. It is recommended that you change only as much money as you think you may spend as local currencies cannot be removed from the country or easily converted. Check a financial newspaper or www.xe.com for the current exchange rate prior to departure. ATMs are widely available, although few accept debit cards with microchips. Credit cards are widely accepted across the country - even in small grocery stores and shops. While traditionally Mongolians don't tip, tipping is accepted in tourism related fields - guides, drivers, restaurants, bellhops, etc. Ten to 20 percent is standard in these situations. https://wikitravel.org/en/Mongolia and https://www.lonelyplanet.com/mongolia offer a wealth of information. This trip is open to all individuals in excellent physical condition. Prior knowledge of, and comfort with, rope travel, the use of crampons, and ice axe arrest is recommended. Our experience shows that individuals perform better and enjoy the adventure more if they have a high degree of fitness and comfort with basic mountaineering skills. This program’s remote nature and snowy terrain contribute to make this a very worthwhile challenge. Mountaineering requires a high degree of physical stamina and mental toughness. Even for the healthiest and fittest individuals, this qualifies as an extremely challenging endeavor. Be intentional. Focus on gaining the necessary strength, stamina and skills to meet the physical demands of the trek. Be sport-specific. The best fitness and training program mimics the physical and technical demands of your trekking objective. The closer you get to your program date, the more your training should resemble the climbing. Most of the required equipment is available for purchase from our affiliate Whittaker Mountaineering. RMI climbers receive a 10% discount on new clothing and equipment items ordered from Whittaker Mountaineering when they use code RMI2019 at checkout. This offer excludes sale items, rentals, meal packages, and Feathered Friends. 12 point adjustable crampons designed for general mountaineering are ideal. We highly recommend anti-bot plates to prevent snow from balling up underfoot. Rigid frame crampons designed for technical ice climbing are not recommended. On Mongolia: Mt. Khuiten you will need mountain snacks for 5 days. All of your mountain snack items should weigh 5 - 6 lb. Breakfast, lunch, and dinner meals on the mountain are included as indicated in our Trip Itinerary. With the exception of hotel breakfasts, most restaurant meals are on your own. You are responsible for your own bottled water and drinks. Recommended mountain snack items: dry salami, smoked salmon, jerky (turkey, beef, fish), individually wrapped cheeses such as Laughing Cow or Baby Bell, crackers, bagels, candy bars, hard candies (Jolly Ranchers, toffees, Life Savers), gummy bears, sour candies (Sweet Tarts), cookies, dried fruit, nuts, energy bars, GORP mixes, and drink mixes (Gatorade/Kool-Aid). We may have a chance to purchase additional food in Mongolia but we recommend you take what you need and only supplement with local food if necessary.